McSame has swallowed a big old gulp of Bush's "Do as I say, not as I do" and "yer either with us or agin us" methodology for foreign policy and washed it down with a chaser of Clint Eastwood tough guy bravado. Hence the screen cap, my approximation of a Eastwood-esque stare down. McCain's stated desire to kick Russia out of the G8 is laughable on its face and yet another area in which McCain will flip-flop, as Steve Benen so perfectly deconstructed earlier this week. And what is instigating this ultimately impotent stance? Russia has decided to enact policies that benefit...*gasp* themselves. How dare they think about their interests? Next thing you know, they'll be invading a country that posed no threat on trumped up intelligence and then occupy it for the oil lease rights, alienating the rest of the world with their "my way or the highway" rhetoric, really threatening peace throughout the world and then you know they're really asking for the condemnation of the rest of the global community. UPDATE: Wasn't it helpful for George Stephanopoulos to correct John McCain when he forgot Putin's new political status as Prime Minister? Remind me again, why should we believe that McCain has the experience in foreign policy? He can't keep anything straight. STEPHANOPOULOS: Let me ask you about your position to exclude Russia from the G-8. How are you going to get that done? Every other G-8 nation is against it. STEPHANOPOULOS: You've got some visitors here. 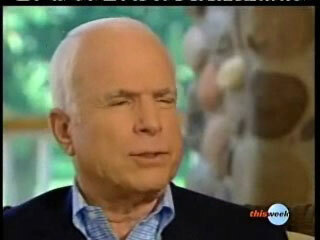 MCCAIN: ... and the world. That's Sam. Look at Russia's actions in the last week or so. He'll get out of here. STEPHANOPOULOS: He'll get out. It'll be fine. MCCAIN: In the last week or so, look at Russia's actions. They cut back on their oil supplies to the Czechs, because the Czechs made an agreement with us. They have now thrown out the -- or forced out -- BP out of Russia. And by the way, I -- a lot of us thought that might happen. STEPHANOPOULOS: ... to help secure nuclear weapons. We need them to help contain Iran. To kick them out is going to make it harder, isn't it? STEPHANOPOULOS: The former President Putin. MCCAIN: ... his government -- former President Putin, and now Prime Minister Putin -- has taken his country down a path that I think is very harmful. STEPHANOPOULOS: Do you still think he's in charge? MCCAIN: Oh, yes. I am confident -- yes, I believe that he's in charge. And I don't think he would have chosen his successor, if he didn't think he would remain in charge. STEPHANOPOULOS: Well, let me get back to the original question. MCCAIN: They've become -- they've become an autocracy. STEPHANOPOULOS: Because President Medvedev says this proposal isn't even serious. So, I go back. How are you going to exclude Russia from the G-8, when every other country is against it? MCCAIN: I will stand up for what I think is the best for the United States of America and the world, the way that Ronald Reagan went to Berlin and said, "Tear down this wall." And they said, "Oh, he's a cowboy. He's going to make relations worse. He shouldn't say that." And yet, we wanted the Wall down. We want better Russian behavior internationally. And we have every right to expect it. And I will do what I can to see that they reverse many of the behavior patterns, which have really been very unhelpful to peace in the world.